It’s Brian Rose’s fault that I open the innings. He is to blame. We were in Sheffield, sipping Zambuca with flaming coffee beans in it, around which we clustered as Eskimos around a log fire. Rose mentioned my equable temperament, secure technique and manifest heroism. It occurred to me that he was a pretty nice fellow, whereupon he added that I was the sort of chap he needed to open the innings. He rather slipped it through my defences, observing that he’d been opening for years and, as might a soldier at the front, he yearned for a quieter life. Cleaning no. 1 item of kit, spectacles! Eight years ago this was. 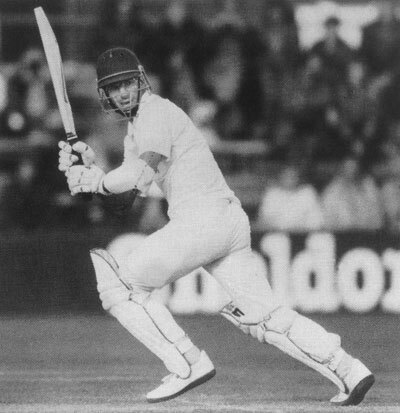 l’d enjoyed a career batting in the middle-order, after Richards and Botham – the sago after the steak. Since then I’ve been the tomato soup. Every winter I polish my helmet with the grille, inside of which you feel like a caged bird. Every spring I attend the Association meeting at which there are yet more men with legs like concrete pillars, biceps like pasties and a demeanour indicating that the winter has been spent dreaming of bouncers. I was following the fortunes of Tottenham Hotspur; they were doing press ups. Things have not been the same since that moussaka in Sheffield. Upon the field a fellow passes his time wondering whether he will be forced to bat for a few overs as the sun sinks and ‘Emmerdale Farm’ begins. Throughout the day an opening batsman scans the opposing team’s balcony to see if they are contemplating a declaration. Uncertain whether he must endure these last minutes of evening, an opener is forever alert. He prepares for bumpers, practises his strokes, ponders his technique. As the fateful hour of probable declaration approaches, he examines the pavilion in the hope of seeing the opposing captain struggling to complete a crossword or the visiting fast bowlers basking in the warmth. He is less pleased if he sees his foes stretching their muscles or thumping each other with boxing gloves. No-one else in the team shares the openers’ fears except the youngster who has been appointed to be nightwatchman. When the others leave the field they remove their socks, rest their bones, light a cigarette and prepare for the evening in an unhurried manner. Meanwhile the openers are washing freshness into their faces, buttoning on a clean shirt, strapping on pads, tying on a thigh pad and waiting for the bell which indicates that play is about to resume. If those fiery overs are survived, the rigmarole is repeated next morning. with the clock ticking its way to 11 , and the lower order batsmen sipping cups of tea, confident that the openers will see off the fast bowlers, soften the new ball (David Lloyd used to aim his first stroke at the nearest available concrete on the grounds that nothing “buggers up t’new ball like concrete”) so that the lighthearted men at 3, 4 and 5 can please the crowd with elegant strokes against friendly spinners. And yet there are compensations. The first few overs of an innings, the early skirmishes as the battle begins, are a private contest between bowler and batsman. Immense satisfaction can be taken at seeing Marshall and Holding retiring to long leg ready for a rest. Not only has the batsman’s technique passed a rigorous test, but his courage has been stretched too, and has not broken. It is a feeling akin to returning from battle with a uniform emblazoned with badges. You know you are tough. Opening batsmen, as a breed, regard everyone else as cissies. We don’t think they understand the thrill and the fear of walking out to bat with an empty scoreboard beckoning across the field, and a fast bowler waiting at the top of his mark. 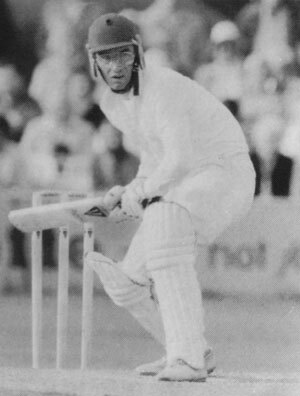 To open an innings is a particular craft demanding a technique beyond that required when the ball is old and the bowler tired. I’d opened at school, and from time to time elsewhere, but for the most part my game had evolved from the softer experiences down the order. I preferred to play forward and scored mostly in front of the wicket. 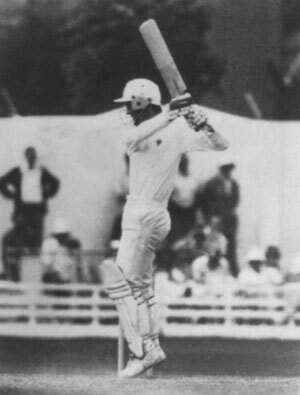 In my first season as an opener, I lost my wicket repeatedly to catches behind the wicket, playing at too many balls moving away from the bat and towards the greyhounds in the slips. To avoid this, the ball had to be played as late as possible, with no stroke chosen until after the ball had moved. Brian Close used to advise his team to play “not the first line but the second”. In the last six seasons I’ve learned to wait till the ball is under my chin before deciding whether or not to play it. 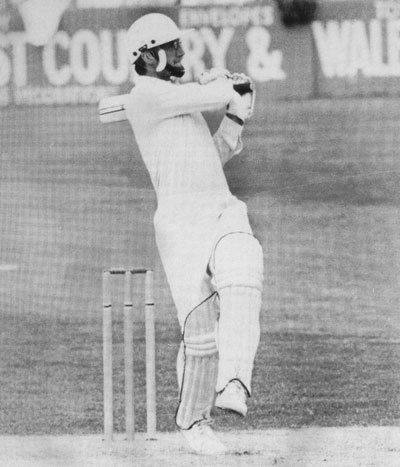 l’ve learned, too, to play shots off the back foot – particularly the square cut and the drive through point – strokes over which Boycott has a mastery. 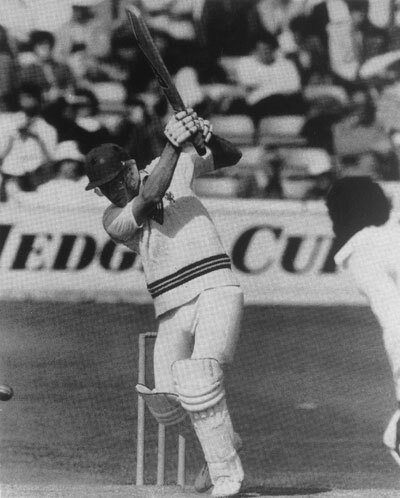 Batting in the 1982 Benson and Hedges Final at Lord’s. These days most of my runs are scored square of the wicket. My batting is arranged to resist short deliveries and to defeat the moving ball. Unfortunately, this means that too many half volleys avoid punishment, partly because they are such a surprise and partly because of a reluctance to attempt forcing drives. Curiously the bowlers who most disturb this approach are those who pitch the ball up, who encourage the batsmen to step forward and into an aggressive hit. 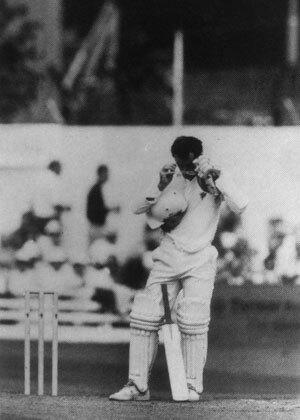 Men like Ellison, Lever and Mortensen swing the ball and bowl to a full length, denying the batsman the chance to watch the ball off the pitch. 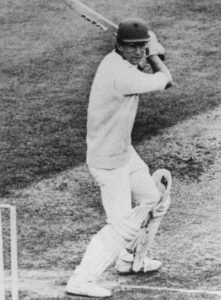 Nash of Glamorgan was difficult for the same reason – because he was slower through the air the batsman could not score runs with deflections. He invited batsmen to drive at the ball from the beginning of their innings. Moreover they were driving at a ball which might change its course in mid-flight. 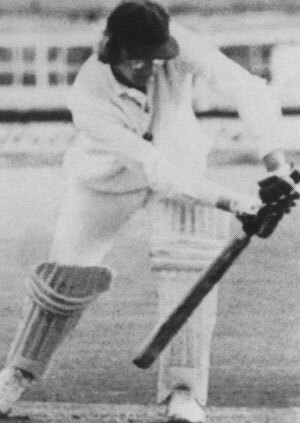 Barry Richards regarded Nash as his most threatening opponent and changed his technique whenever he met him, standing outside his crease in an attempt to avoid lbw decisions. Early days: note the gloves! After seven years of opening Somerset’s innings with a measure of success I’ve learned to respect my fellow openers. 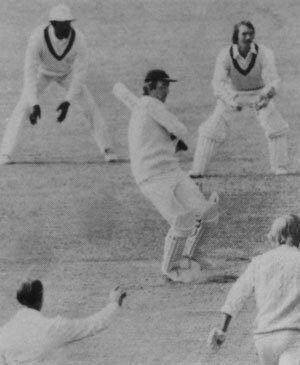 Boycott and Alan Jones, men in their forties, continued to face the fastest bowlers in the world, on pitches sometimes covered by fingers of grass, day after day, year after year, returning thousands of runs. They and their brothers are men of craft and fortitude. Happy hooking in the days before I became wiser. Now I am Somerset’s senior professional. In a year a two, I’ll take a team-mate out to an amiable restaurant somewhere and whisper to him that he is just the sort of fellow a team needs to open its innings. Then, if we’re in the field, I’ll stand and wonder what is for supper.